The 15th annual Festival of the Lakes ensures everyone is included in the event’s fun and excitement by offering both Senior Day and Special Person’s Day to the community. 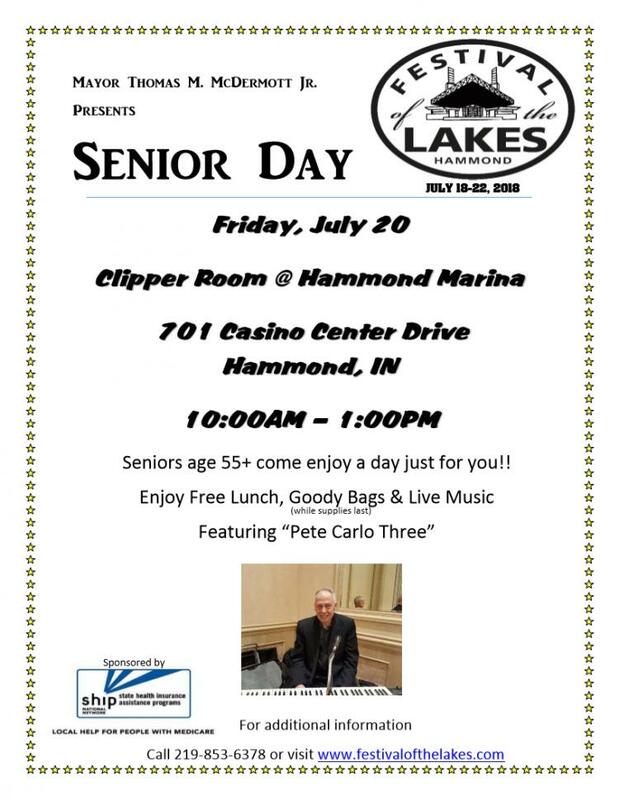 Senior Day, held on Friday, July 20 from 10 a.m. to 1 p.m. in the Clipper Room at the Hammond Marina, 701 Casino Center Drive, (note: this is a location change) invites seniors aged 55 and older to come enjoy an afternoon of dancing, a free lunch provided by California Donuts, and music by Pete Carlo Three. Special Person’s Day, held on Friday, July 20 from 3:00 pm to 5:00 pm (note: this is a day and time change) on the Festival grounds near the carnival at Wolf Lake Memorial Park, allows those with special needs to enjoy free rides from Modern Midways and lunch provided by California Donuts and Pepsi. There will be no charge to park if you arrive before 4 pm. Both days are free and offer goody bags to everyone in attendance while supplies last. Wolf Lake Memorial Park is located at 2324 Calumet Avenue in Hammond, Indiana. click for details or call 219.853.6378 for more information.